I recently finished re-watching Twin Peaks for the last time. One day, I’ll watch it again, but I’ll never be able to watch the original series the same way again. The more you access a memory, the more it changes. Your recollection of events from your life remain more like reality if you leave them behind you and access them only rarely. The more you replay a moment in your life, the less reliable your memory of that moment gets. Memory is a fickle thing. We introduce new colours and new experiences and, of course, you can never re-live a memory. And you can never remember exactly how it was. 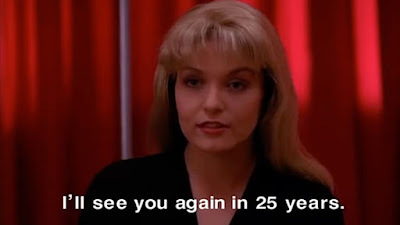 In the twenty-six years since Twin Peaks first aired on Australian television (it premiered here on February 24th, 1991 – the day Laura Palmer died and the day before my 16th birthday), I have watched the series through a number of times. On VHS, recorded from TV. On a released set of VHS tapes. On DVD (both the Artisan & Gold Box releases). And on BluRay. It’s hard to remember exactly how I reacted to the series when I first watched it. I knew it was unlike anything I had ever seen, but I was sixteen at the time. What did I know? I clearly remember discussing the pilot at school and there was a question of whether Sarah Palmer’s vision at the end meant the series was headed in a supernatural direction. Little did we know. I remember talking about Dale Cooper’s very strange dream in the red room with the little man. I remember a discussion about whether grief-stricken Leland falling on Laura’s casket was a clue. 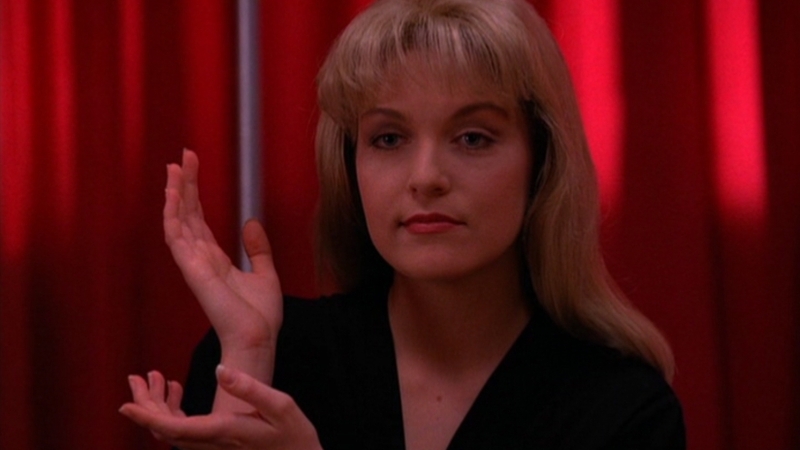 And I remember thinking that this was a deep, dark secret held by the TV creators – even though the reveal of “Who Killed Laura Palmer” had actually aired in the US the previous November. The world, and spoilers, moved slowly in 1991. I only had the last six or seven episodes on tape for years and I watched those episodes a lot, especially the final four episodes, which aired as two two-hour specials around Sept/Oct 1991. I’ve watched the final hour countless times, trying to figure out what really happened to Dale Cooper and how the multiple cliffhangers might resolve themselves. I remember the excitement of being able to hire the show from a local video store; to re-watch for the first time, and introduce several friends to the series. It was strange to finally revisit Twin Peaks, which had influenced a lot of my writing in late high school and when I went on to study playwriting and screenwriting. It was a major turning point in my understanding of what television and art could be. And I wasn’t alone. For twenty-six years, I’ve watched the series and read essays about the show and behind-the-scenes books and watched documentaries. I wrote a follow-up script to the series, just to try to deal with those many cliffhangers and I ran a roleplaying game for my friends to resolve Dale Cooper’s ultimate fate. Each and every time I revisit the series, I see it differently. I catch things new things I’ve always missed. Or I appreciate different things about the writing or the production or the acting. Hard to not reflect on having co-created my own supernatural drama series (Sonnigsburg) in the years since David Lynch and Mark Frost announced they were returning to their own mystery town in the Pacific Northwest. Every time you revisit a memory it changes. Every time you revisit a place, it’s different. 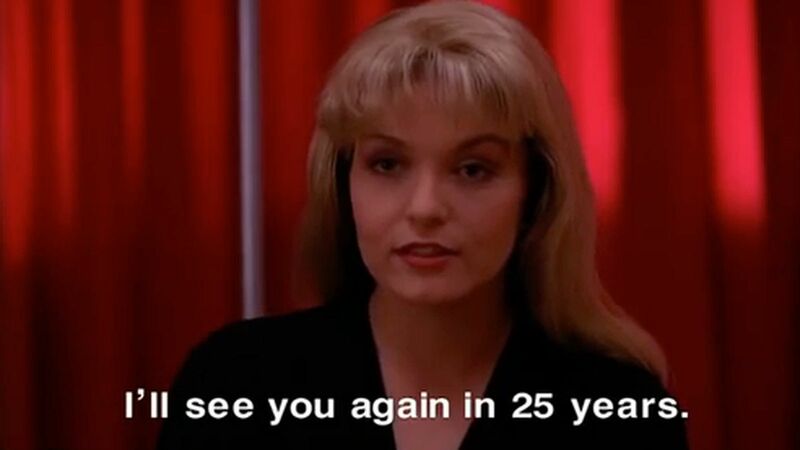 Every time you watch Twin Peaks, something has changed. We see things differently. We appreciate different aspects of the whole. In two weeks’ time, Twin Peaks: The Return begins. Whatever story it chooses to tell, however many of the original mysteries Lynch/Frost decide to answer, I will never be able to watch the first two seasons the same way again. Oh, sure, over time you can put terrible sequels and prequels behind you and enjoy the originals again. But never in quite the same way. I recently finished re-watching Twin Peaks for the last time. I’m looking forward to seeing it again for the first time one day.